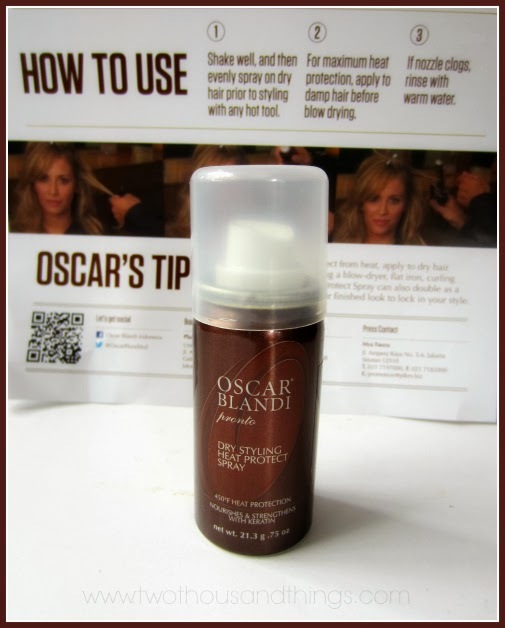 This is the third Oscar Blandi product that I've tried and so far I am liking them all. 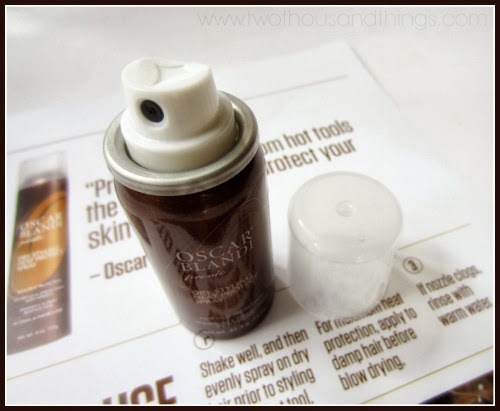 I love Oscar Blandi products because their products seems to always deliver what they promised. Starting from the Invisible Volumizing Dry Shampoo and the Instant Glossing Cream, and now this Dry Styling Heat Protect Spray. If you use hot hair tools such as hair dryer, flat iron, curling iron, etc than it is suggested that you should put on a heat protective serum / spray on your hair before you use those tools. It's important to protect the strands of your hair from the heat of the hair tools that sometimes are too hot for your hair without you realizing it. The heat from your hair tools can heat up to over 200 degree celcius and while this heat gives you style but it can also damage your hair and would cause dull, coarse, and dry hair if you use them too often without protecting your hair. That's why using some kind of heat protector on your hair before you use any hot styling tools is a must. I've been using heat protective spray for several years now ever since I found out about that fact. I always use it before hair drying or using any hot tools. I don't want to end up with coarse dull hair (eek!). 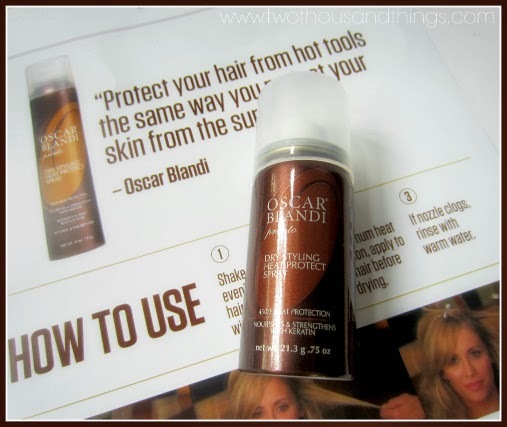 Nowadays my choice of option is the Oscar Blandi Dry Styling Heat Protect Spray that can also act as a light hair spray beside as a heat protector. 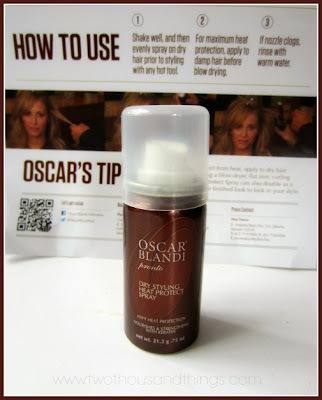 This dry spray formula is enriched with keratin proteins to help nourish, strengthen, and also protect the hair. The Keratin protein helps hair withstand the extremely hot temperatures while repairing the damage caused by the hot tools. This Dry Styling Heat Protect Spray also provides instant style-refreshing benefits, allowing us to easily and effortlessly reshape and hold our hair style. It comes in a nozzle / spray bottle with a light mist that spreads away on areas of hair. The formula is quick-drying so we can use the hot tools right away without having to wait too long. The quick-dry spray blends seamlessly with all hair colors while infusing a zesty lemon verbena scent on to the hair, a signature scent of Oscar Blandi products. I love that it cuts the time to dry my hair when I use hair dryer, it only took half the length of my usual time, which is so awesome! I also found that flat-ironing my hair is now easier if I'm using this heat protect spray, and it does seems to help my curls stay a little bit longer, probably because of it's ability to also act as a light hairspray. I want to keep my hair healthy and I believe this heat protect spray can help me with that by protecting it from overheating. This Dry Styling Heat Protect Spray is also paraben-free and alcohol-free, and also contain patented polymer complex that are clinically proven to protect hair from the heat & also prevent breakage on hair. Mine is just a travel size / sample bottle but the one in the market is a big 4oz / 113gr bottle which retailed at IDR 330,000. You can stop by at Oscar Blandi boutique counter at Plaza Senayan and Kota Kasablanka to try them on or to know more details about the product. Oh really interesting product, personally I never tried before a Dry Shampoo for that reason is interesting read about this product.